Snopes owner&nbsp;David Mikkelson poses next to a&nbsp;doctored storm photo. He is at the center of a legal battle for control over the popular fact-checking&nbsp;site. 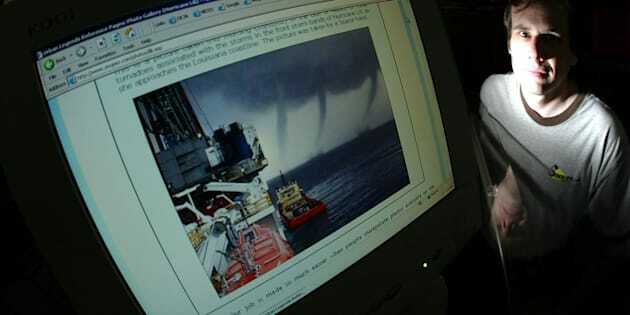 Snopes owner David Mikkelson poses next to a doctored storm photo. He is at the center of a legal battle for control over the popular fact-checking site. Snopes, a site dedicated to fact-checking everything from political claims to urban legends, says it has raised more than half a million dollars after pleading with its readers for donations as it weathers a complicated legal battle. The site is “in danger of closing its doors,” the staff wrote Monday in a letter to readers, because “an outside vendor” they previously hired has allegedly taken control of the site. According to Snopes staff, the unnamed vendor has prevented Snopes employees from modifying the page, has continued to place ads on the site and has not paid Snopes any of the revenue from the ads ― the only source of income for the site ― despite Snopes terminating its contract with the vendor. Our legal team is fighting hard for us, but, having been cut off from all revenue, we are facing the prospect of having no financial means to continue operating the site and paying our staff (not to mention covering our legal fees) in the meanwhile. Details in the letter are scant, and Snopes did not immediately respond to HuffPost’s request for further information. However, the letter appears to be tied to an ongoing legal battle between David Mikkelson, founder of Snopes’ owner Bardav, Inc., and Proper Media, a website management company. In May, Proper Media sued Mikkelson for “unlawful jockeying for ownership and control” of Snopes, as Courthouse News reported at the time. Here’s where things get messy: The scuffle for control over Snopes is rooted in Mikkelson’s divorce from his wife, Bardav co-founder Barbara Mikkelson. After the pair split and divided ownership of the company in half, she sold her 50 percent stake to Proper Media last July. The deal was structured as a sale to Proper Media’s five shareholders, one of whom the company says conspired with David Mikkelson to retake control of the company through their combined shares. The shareholder in question, Vincent Green, allegedly blocked Proper Media’s access to “personnel, accounts, tools, and data necessary to manage Snopes,” the lawsuit says. Green parted ways with Proper Media last year and began working directly for Bardav, therefore breaching Proper’s operating agreement and general services agreement, the lawsuit alleges. While Snopes has been in operation since 1995, the website soared in popularity and credibility during and after the 2016 election, serving as a reliable researcher into “alternative facts” and questionable new reports. It ranks among the 700 most popular websites in the U.S. This article has been updated with new details on its fundraising achievements.